A standard deck of cards (no Jokers). The game is played in 5 rounds. In each round, the players take actions simultaneously. 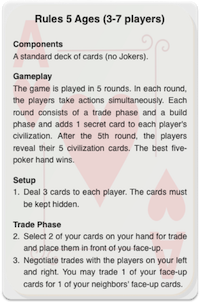 Each round consists of a trade phase and a build phase and adds 1 secret card to each player's civilization. After the 5th round, the players reveal their 5 civilization cards. The best five-poker hand wins. Deal 3 cards to each player. The cards must be kept hidden. Select 2 of your cards on your hand for trade and place them in front of you face-up. Negotiate trades with the players on your left and right. You may trade 1 of your face-up cards for 1 of your neighbors' face-up cards. You may choose to trade both your cards to the same neighbor and you may choose not to engage in any trade at all. Move cards received in trade to your hand. They may not be used for trade the same round. Also move cards not traded to your hand after the trade phase. After the trade phase, you should have 3 cards on your hand again, of which 1 or 2 may have been traded from your neighbors. Secretly select 1 card from your hand and place it in front of you face-down. This card is part of your "civilization" and may not be revealed, until the end of the game. Optionally replace 1 previously placed civili-zation card with 1 card from your hand. Draw a new card to your hand (except for the 5th and last round). After the build phase you should have placed 1 card to your civilization and have 3 cards on your hand (2 cards after the 5th round). Repeat the Trade and Build phase 5 times. At the end of the game you should have placed 5 civilization cards. Reveal your civilization cards and determine the winner. The player with the best five-poker hand has built the most glorious civilization and wins. Adam draws A♠ 7♠ Q♥. In the trade phase, he keeps A♠ on the hand and offers 7♠ Q♥ for trade. Eva offers 10♦ 4♠ for trade. Adam and Eva agrees to exchange Q♥ for 4♠. Adam refrains from trading 7♠ with the intention of collecting spades. In the build phase, he uses A♠ for his first build and keeps 7♠ 4♠ on the hand. He draws a new card to his hand, which turns out to be 2♣. However, he is not worried since he has 2 other spades to use for builds in round 2 and 3. Add 2-4 Jokers to the deck for war rules. Jokers may be drawn as ordinary cards and may be played in the Trade phase to attack a neighbor. If placed as the leftmost trade card, the left neighbor is attacked, and if placed as the right most trade card, the right neighbor is attacked. The attacking player draws a random card from the defending player's civilization cards and adds it to his or her hand. The defender draws a new card from the deck and places 2 civilization cards instead of 1 in the next Build phase. In the following cases, Jokers have no effect on the defending player. The attacking player/s or must discard the Joker and draw a new card. Two players attack the same player. Two players attack each other. The defending player has 0 civilization cards. After a round with wars, the players should still have 3 cards each on their hands and 1 civilization card for each round played.